A lonely bratwurst lies on the stovetop after his lunch, and camouflage curtains decorate the windows. If it weren’t for the 26 inches of ice under his feet, the cozy confines of his ice house might be mistaken for a cabin in the woods. Forming a small city of ice houses near Tobacco Gardens Resort & Marina on Lake Sakakawea last month, 76 two-person teams of the eighth annual Relay For Life fundraiser tournament tapped into the wintry, watery pastime. 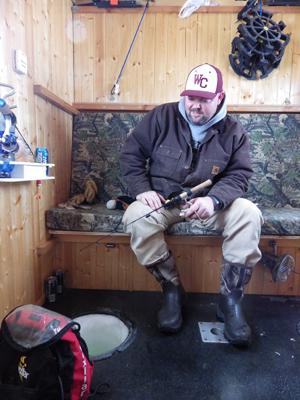 Rex Korslien, the event’s organizer, said he loves being on the ice, even though fishing hadn’t been the best on tournament day, Saturday, Jan. 21. As western North Dakota boomed in the last five years, so did ice fishing. Korslien estimated about 200 houses on the ice on tournament day, growing exponentially in recent years. “Prior to that, there’d probably be a dozen out there and we knew every one of them,” Korslien said. Korslien’s mother-in-law Peggy Hellandsaas, owner of the Tobacco Gardens resort, said the first house went out on Dec. 8 this season, and the season’s length depends on the ice. The bite is a dependent factor too, she added. Korslien said fishing was phenomenal in early January, but it wasn’t as hot on tournament day. Still, a 9-year-old boy caught a near 24-pound northern pike in late December, Hellandsaas added. “He was just pumped,” she said. Meanwhile, the season makes Tobacco Gardens a popular place as in summer, but it is different, Hellandsaas said, as people can pop into their ice house on evenings and weekends. Ice houses like Marcy’s, which also functions as a camper in summer. He can cover up the floor’s fishing holes in the 8×28 house that comes equipped with solar panels, water filtration and a washer/dryer. “This is about as extreme as you get,” Marcy, a Williston native, said. Ice safety is important to remember, Hellandsaas said, minding speeds and holes on the ice and generally being aware. No one had fallen through the ice as of Jan. 21, she said, knocking the wood of her cafe’s counter with a small smile, though vehicles have gone through the ice in years past. “You need to pay attention to where you see people driving,” she said, adding she’s not a fan of the ice, but does stay updated on its conditions for resort goers. For first-timers, Hellandsaas recommends ice fishing with someone experienced, which Korslien said is good too, as is inquiring with local establishments. He’s ice fished since birth, he said, and it’s more of something to try rather than teach. Last month’s Relay For Like tournament was Kelly Janicki’s first. 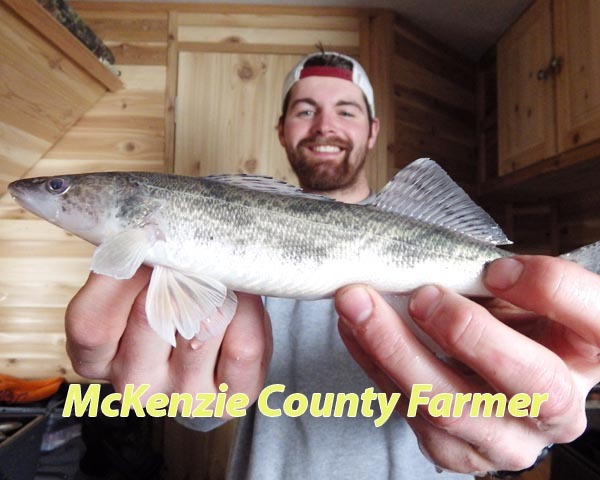 The California native with ties to Wisconsin came to western North Dakota six years ago, getting into ice fishing here with help from Korslien. Beyond the community and fundraising aspects of tournament day, the event offered a 50/50 raffle for prizes ranging from a four-wheeler to portable ice houses to fishing gear, but the calm and relaxation of the pastime is what gets Korslien. “I love things to do on the lake,” he said.